Instructions: Cut a piece of white cardstock to 12 x 6" size, score and fold at 6" to create card base. Cut a piece of purple paper from the Burst of Spring paper collection to 5 7/8 x 5 7/8" size and attach to card base. Use from the HCD1-7214 Ornate Pocket Accents Die to diecut decorative piece from white cardstock. Apply some Dries Clear glue over decorative pocket and sprinkle with Rajni Chawla's Crystal Clear, then attach onto lower half of card front. Use from the HCD1-7227 Eyelet Diamond Die to diecut the largest eyelet diamond from white cardstock and sponge edges with Leaf Green ink, then add the Crystal Clear for extra sparkle. Use from the HCD1-7226 Diamond Basics Die to diecut the largest diamond from white cardstock. Stamp the sentiment from HCPC-3845 Just For You Sentiments Cling Stamp Set in Majestic Violet onto diamond. Use dimensional adhesive to attach onto coordinating eyelet diamond. 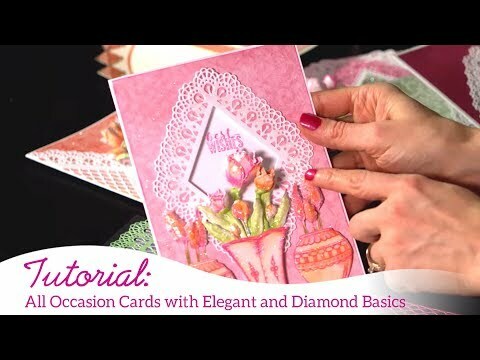 Use dimensional adhesive to attach both diamonds onto the center of the card as pictured. Stamp the right and left facing pansy spray from HCPC-3864 Delicate Pansy Spray Cling Stamp Set in Jet Black ink onto white cardstock and diecut with coordinating dies. Stamp medium pansy 2x and small 1x from the HCPC-3862 Cheery Pansy Cling Stamp Set in Cactus Flower ink onto white cardstock and diecut with coordinating dies. Stamp 3 petaled leaf 2x from same stamp set in Fern Green ink onto white cardstock and diecut with coordinating dies. Use the Stack and Store daubers to color the images. For the pansy petals, use Cactus Flower on the edges and Tiger Lily in the centers. Add a soft touch of Majestic Violet ink onto the edges of petals. For the 3 leaf petals, use Fern Green and a touch of Cactus Flower. For the pansy sprays, use Cactus Flower and Tiger Lily on the pansies and sprays and Leaf Green on the leaves. Use the shaping stylus to shape the pansy sprays. 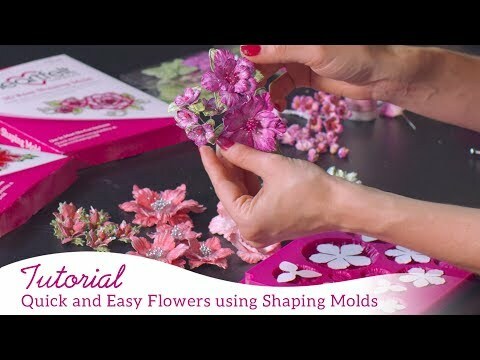 Place the pansy petals and leaves into the HCFB1-473 3D Pansy Shaping Mold, lightly mist with water and send through die cutting machine. Then assemble the pansies together as pictured. Attach pansy sprays onto card, trimming apart as needed. Attach pansies and leaves onto card. Use the Dries Clear glue along with Crystal glitter to add a touch of sparkle over pansies and leaves. Use the same glue to add the Go Man Go prills to pansy centers.